2Click the [User Interface] tree, and click [Button]. 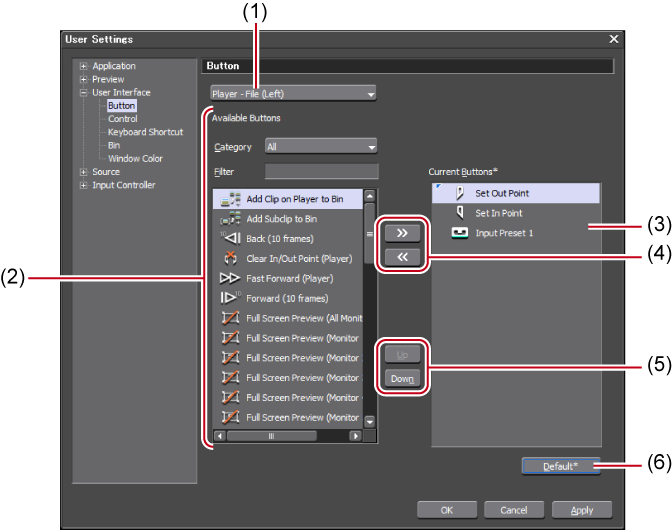 3Select the area to customize from the list. 4From the [Current Buttons] list, select the button one position below the insert position. 5Select the button to add from the [Available Buttons] list, and click [>>]. You can improve operation efficiency by adding and displaying operation buttons that are not displayed by default. *1Available only when you have VTR Emulation Option. See VTR Emulation Option User Guide for more details.